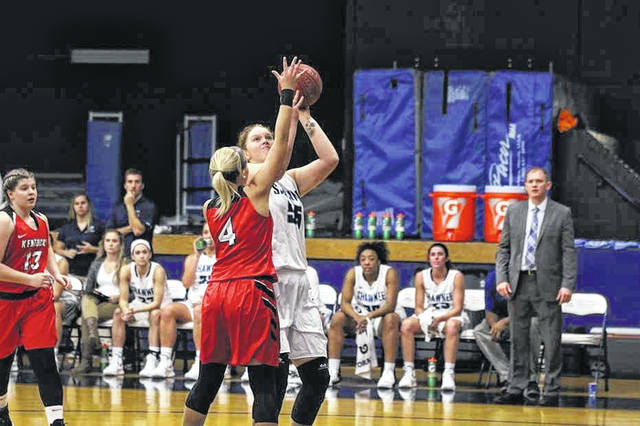 Shawnee State’s Leah Wingeier scored a career high 17 points and snagged a career high 7 rebounds in the Bears win over Wilberforce Thursday night. Portsmouth, Ohio – Shawnee State women’s basketball snapped a losing skid on Thursday night, defeating Wilberforce (Ohio) 74-50 at Waller Gymnasium. A low-scoring first quarter would see Shawnee State and Wilberforce play to a standstill. The Bears would lead by as many as five points early after a three from Bailey Cummins, but Wilberforce would rally to tie the game at 8-8 on a pair of free throws by Nia McCormick. Sydney King put the Bears back up with a lay-in, but McCormick would hit a three to give Wilberforce an 11-10 lead. That lead would reach five points on buckets by Jacie Dickerson and Alexandra Shealey, but Shawnee State then rallied to tie the game before the end of the quarter. Shania Massie hit an and-one play, and Natalie Zuchowski scored in the post to see the score tied at 15-15 after one quarter. Hannah Miller would put the Bears up by two possessions with a three and a pair of free throws, giving the Bears a 20-15 lead. Ashton Lovely then hit two foul shots to make the lead seven points as SSU would not trail again. The Bulldogs cut the lead back down to four points, but Leah Wingeier and Cummins would extend the lead back to seven points. McCormick hit another three to cut the lead to four again, but Wingeier would hit in the post to extend the lead back out to six points. Wingeier had seven points in the last three minutes of the half to lead Shawnee State to a 31-24 lead at the break. The third quarter would be all Shawnee State, as the Bears outscored Wilberforce 22-4 in the period. Shawnee State went on a 15-0 run to begin the half, with the lead reaching double-digits with 7:03 to go on another Wingeier basket. The Bears got the lead to 20 on a Miller three with 1:42 to go in the period, and would lead by 25 at 53-28 at the end of the third quarter. The Bears would maintain that 20 point advantage in the fourth quarter, trading baskets down the stretch to eventually win the game 74-50. Shawnee State shot 49.1% from the field, and 35.3% from three in the win. The Bears held Wilberforce to 29.6% from the field, and outrebounded Wilberforce 35-28. SSU had 23 assists to Wilberforce’s nine. Hannah Miller had 19 points to lead Shawnee State in the win. Leah Wingeier had a career-high 17 points, while also having a career-high seven rebounds. Nia McCormick led Wilberforce with 16 points on the evening. The win sees Shawnee State improve to 8-2 on the season. Wilberforce falls to 3-5 on the season. The No. 2-ranked Bears now lead the all-time series against Wilberforce 21-1. Shawnee State women’s basketball returns to action on Friday, December 7 when they take on Talladega (Ala.) on day one of Shawnee State’s Penn Station Classic. Tipoff is set for 6:00pm at Waller Gymnasium.